Tile Stencils are all the rage in today's DIY decorating! Our Tile stencils are a perfect money saving alternative to the popular but pricey cement tiles. 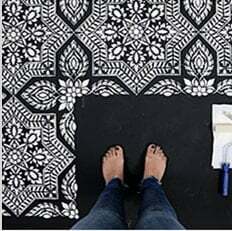 You can stencil them right over your old dated tile floor or an ugly linoleum! Just give your old floor a nice wash and a coat of Stix primer for good adhesion. With our Tile stencils, it is easy to create a dramatic black and white DIY faux tile kitchen backsplash. Tile stencils will save you a lot of money on your kitchen or bath renovation, just imagine that you don't have to rip th old tiles out! Please watch our How To Stencil Tile videos to learn an easy faux tile stenciling technique and which paints and products to use.